Please join us for a screening of Joshua Z. Weinstein’s “Drivers Wanted” at a Queens taxi garage parking lot! Presented by Filmwax and the Queens World Film Festival. This is a one-time-only-free-event of DRIVERS WANTED to celebrate its forthcoming digital distribution. The film will be screened outdoors at the parking lot of 55 Stan, the taxi garage where the documentary was shot. Special guests including Spider —New York’s oldest cab driver— and other NYC taxi celebrities. E or M train to 23rd Street/Ely Avenue. Anyone who cares about social justice surely knows about the sad story of the Angola Three. 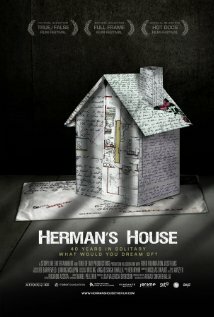 A new documentary, “Herman’s House“, which is having its New York premiere Wednesday night at the Harlem International Film Festival, powerfully states the case against prolonged solitary confinement and how one activist made a huge difference in the life of Herman Wallace. Wallace has been in solitary confinement in Louisiana’s Angola prison for 40 years, longer than anyone ever has been in the U.S. There are doubts about his guilt–the widow of the guard he is charged with murdering even has her doubts. And one can’t help but suspect that his involvement in the Black Panther chapter at the prison is why he still remains in solitary, rather than being in the general prison population. Filmmaker David Garrett will be in attendance for Q&A. When best friend Anna Hollister dies, Grace Parker confesses to their lifelong affair. The revelation strikes at the core of the friendship of the two families, jeopardizing their bond but also spurring an unexpected journey of self-discovery. Jack Feldstein is an award-winning scriptwriter and neon animation filmmaker. Originally heralding from Sydney, Australia, Jack’s trademark style is the neonizing of a combination of live action video recording and public domain material, particularly cartoons. Neonizing is a complex computer-based technique that renders the lines of an image like a neon sign. Feldstein describes neon animation as a deconstructionist, post-modern animation filmmaking style that utilizes appropriation and pop art techniques, in a Warhol meets Vegas look. His rambling seemingly make-it-up-as-you-go-along, stream of consciousness monologue narratives have been likened to Woody Allen and Spalding Gray, but with an Australian twist. Feldstein was a scriptwriter for many years before, as he puts it, he woke up one morning and began making neon films. From a cramped Chinatown apartment shared with three roommates, political outsider and passionate progressive Paul Newell draws a plan to make his first run for public office: to challenge the most powerful politician in New York State, Assembly Speaker Sheldon Silver. Director Justin Sullivan & Paul Newell to be present. Copies of the DVD will be available for purchase. Director Maria Ibrahimova and producers Raphaela Neihausen & Irina Vodar will all be in attendance for a screening & DVD release party of “Miss Gulag”. Through the prism of a beauty pageant staged by female inmates of a Siberian prison camp emerges a complex narrative of the lives of the first generation of women to come of age in Post-Soviet Russia. “Miss Gulag” explores the individual destinies of three women: Yulia, Tatiana, and Natasha, all bound together by long prison sentences and circumstances that have made them the vigilantes of their own destinies. For these women, undoubtedly, life is harsh under the constant surveillance of UF-91/9, but it is no less so on the outside. Today they, their families, and loved ones are sustained by hope for a better life upon release. This is a story of survival told from both sides of the fence. WHAT IF SOMEONE WROTE YOUR AUTOBIOGRAPHY? 200 hours of footage, dusty boxes of film, a broken editing computer: these were the pieces of filmmaker Richard P. Rogers’ daring attempt to make his own autobiography. He died in 2001, leaving behind a lifetime of filmed memories, until his student and protégé, Alexander Olch began making a movie out of the pieces. Writing in his teacher’s voice, working with with Wallace Shawn, Bob Balaban, and Richard’s wife – acclaimed photographer Susan Meiselas – Olch steps into his mentor’s shoes and his past – to make a film that was impossible to make. An autobiography, that isn’t. A documentary which is fiction. A lifetime of questions, finally answered. Director Bruce Van Dusen will introduce his 2005 indie comedy and participate in a post screening Q & A. In “Backseat”, a ‘coming of age late’ story about prolonged adolescence, two old friends flee New York City on a three-day road trip to Montreal to escape their problems and meet the great Donald Sutherland. Between running drugs and meeting a man who only communicates through instant messaging, they run head-on into the always lingering problem of real life. In “51 Birch Street”, one of the most highly praised personal documentaries of recent years, director Doug Block took a hard look at his parents’ marriage and his own relationship with his father. Now Block turns in the other direction, offering an exceptionally moving film about his relationship with his only child, Lucy. This time of transition comes with its fair share of struggles. To his credit, Block does not shy away from these moments, nor from the humorous yet occasionally tough analysis his wife offers. The result is a personal story told with such honesty and intimacy that a singular experience unfolds into a universal tale of parenthood, marriage, and family— making this a film that fathers, mothers, sons and daughters can equally appreciate. The outrageous outspoken and just plain out Reno will be in attendance to introduce her 1998 HBO special. “Reno Finds Her Mom” follows oddball comedian and political screamer Reno through her real life search to find the birth mother who abandoned her as an infant. The camera follows Reno out onto the streets, into the halls of bureaucracy, across the country – or wherever the trail may lead – en route to solving the mystery of her birth. As a docu-comedy, the program uses a raw cinema verite approach to the actual search blended with heightened fantasy sequences in which Reno both looks forward to and dreads the truth that awaits her. The Renos (the couple who adopted the 3 month old Reno when they were of grandparents’ age) are supportive of Reno’s search. But winding through “Reno Finds Her Mom” is the fact that Reno never felt at home with the Reno family. She has not been able to let herself off this hook, this quandary over her place, her role, what the hell she is doing in the Reno family picture. Her misfit identity is clear. Among other places, her genes never belonged in suburbia. Mary Tyler Moore plays Mrs. Reno in several fictional sequences where Reno remembers what it was like growing up. “Mom, did you ever know I was funny?” is a hilarious scene wrought with black comedy. Lily Tomlin, Reno’s actual childhood idol and inspiration, plays Reno’s godmother who lives in her brain, pushing her along her way. Reno starts to see the search for her biological mom as a necessity, an inevitability, like Medea with the burning kids. All signs point. All bells clang. Her life has always been in tumult, but over the past 2 or 3 years, she has experienced a significant rise in the chaos. Reno’s unfaith in the state arrives in full dress suit the moment she starts searching in full time earnest. She tries all the legal means. Nothing, until a social worker accidentally lets loose Mom’s birthdate. Then the illegal means — all the while, spy cams whirring. Calling people with her same birth name adds another layer of deceit as she spirals so deep into genealogy land she’s gotta keep a bogus family tree just to keep track. One of the deepest and most ferocious fears is that if she does find her Mom, her Mom will not want to be found. Three and a half months into the search, the social worker seems to be the only chance left. That’s when she admits that the 100 year-old agency has actually lost Reno’s file. Identity deleted, Reno is desperate. She talks to some detectives, but has doubts about their methods (and their fees). Who do you go to when you’re desperate to find someone? Even yourself? Where do the CIA, the FBI, the Army Intelligence guys, go after they retire? Just under twenty four hours later, Reno, (with lots of cash in small denominations) arrives at an address out in Long Island. If Reno thought she knew that committing this story to film would present her with difficult moral and ethical questions, they were bupkus once she was holding the name and address of her birth mother in her hands. All of sudden, Reno’s birth mother fantasy had changed into an unknown reality. Reno had never imagined her mother to be a Puerto Rican and Cuban Republican who owned factories in her rock bottom least favorite town in America–L.A.! The whole “city” is the suburbs. Turns out Reno’s mom was glad to be found. She said she’d had a hole in her heart for 40 years. She had lied about her own Latina heritage in order to get baby Reno a “better” placement. But her story had been a real life secret and lie, and most of her family, including her other children, had never been told. Her guilt and shame translated into fear of being publicly identified. And Reno has a lot of explaining to do about the movie! Did she find her mother to make a movie or because she wanted to find her mother? For Reno, whose material is her life and her life is her work, this ethical issue continues to find shape as Reno finds that each of our lives are huge jigsaw puzzles sometimes in contextual, but most often in arbitrary, juxtaposition with each other. The pieces will never neatly fit. And maybe Reno is calming down about this reality. Finally.